BANGI, 10 Jan 2014 – More than 30 youths from all over Kedah received free training in photography from a UKM photographer in Sik, Kedah last week. The workshop was the initiative of Abdul Raai Osman, a photographer with the UKM News Portal then on holiday in his kampung who felt that he had to do something to contribute to the community there. Using his 35 years of experience in UKM he decided to give the free photography lessons with the hope that it would allow the youths there to generate their own incomes. He got the idea after listening to speeches by UKM senior officials about how the university needed to engage the community. His efforts showed that everyone regardless of position and background can make a contribution to society if they wanted to. Raai said he is neither an intellectual nor does he hold high office in the university. Thus one of the few ways that he can contribute is to impart his knowledge learnt in UKM. “I only have 4 more years of service left before retiring. I just want to do my part in helping the community and at the same time enhance UKM’s reputation,” he said. The workshop was made possible with the collaboration of Sik Recreational Association (SRA) and Sik Department of Youth and Sports (DYS). The two day workshop trained youth in both theoretical and practical aspects of photography. Raai also took the opportunity to highlight UKM’s achievement and distribute brochures to the participants urging them to choose UKM if they wanted to further their studies. 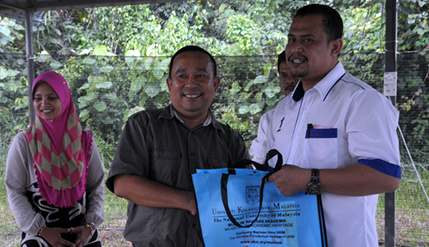 Kedah State Assemblyman for Jeneri, En Mahadzir Bin Haji Abdul Hamid was present during parts of the workshop.